Tender succulent plants have certain strategies - in their case, ways of surviving dry conditions. They come from many different genera - or groups - of plants which explains why they can be so different in appearance. Sometimes known as desert plants for where they originated, or 'fat plants' for their appearance, they use many different ways to combat drought. Some of them have a waxy powdery coating called 'bloom' or 'pruinose' on their leaves to protect them from hot sun and prevent water loss. Others have hairs for the same reason. Many have puffy, water storing leaves or stems. Some avoid drought by going dormant until better times arrive. 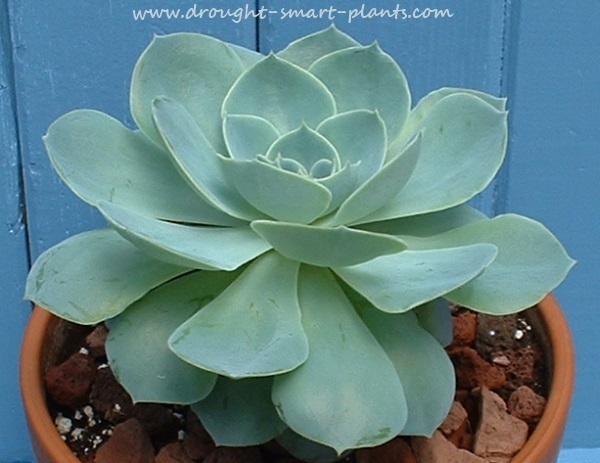 A succulent plant in very dry conditions can lose much of its internal moisture without killing it; it will shrivel and look like a prune, but when the rain - or the watering can - returns, it plumps up again. This is a double edged sword, as if they have too much water or are allowed to sit in it, they'll rot very quickly and turn to black mush. Not pretty! 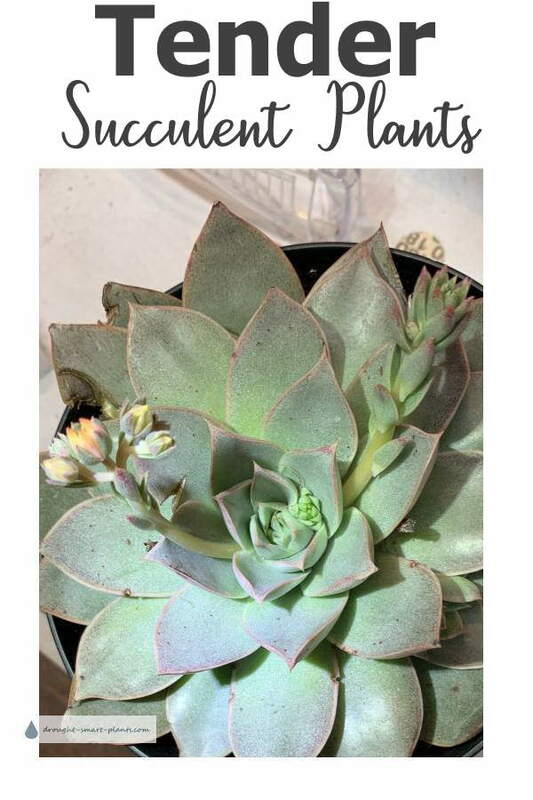 Echeveria are some of the most gorgeous and sought after of all tender succulents - although called hens and chicks, and related to Sempervivum, the hardy houseleek, they will live on after blooming. The arching flower stalks will be produced once a year depending on the species. There are many containers for succulents to choose from - make sure the one you choose has a drain hole! In some cases you can drill a hole into a ceramic or glass dish with care. You'll need an experienced person to help you with this, and a masonry bit for a drill. I mostly use terracotta clay pots because they drain well, and are also heavy enough to keep the plant from falling over if the soil is dry. If this is a problem, such as with little four legged friends knocking over plants or in windy areas, try putting several rocks or a gym weight in the bottom of the pot. Succulent plants of all kinds, hardy and tender ones alike, absolutely must have very good drainage, in both the pot you choose, and the soil. I use a very fast draining commercial peat based mix, with extra 'aggregate', in this case perlite and pumice. You can mix your own soil-less media, and add extra small gravel or sand to it. Make sure you don't use regular unpasteurized garden soil for indoor use or in containers as you could bring in pests and it also packs much too tightly around the roots. Find out more about succulent soil here. My greenhouse in summer is filled with all kinds of tender succulent plants. These range from easy to grow types of succulents, to more challenging ones like Lithops. The succulent plants, not being hardy in Zone 5, are moved indoors for the winter. I grow most of them under fluorescent lights, which are on a twelve hour timer, giving them the day length they would get if grown on the equator. While indoors, they get very restricted water, as they tend to rot if they are watered too often. 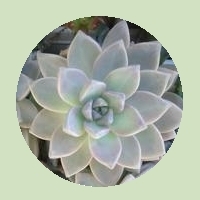 See how lucky gardeners can landscape outdoors with tender succulent plants in California. Some of the most successful succulent gardens can be found in areas that are typically warm and dry year round, with little to no frost in winters. 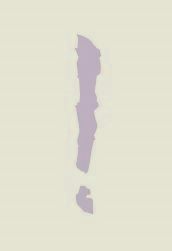 Think 'California' or 'Mediterranean' climates. Most of the varieties of tender succulents I grow are pretty forgiving, and even if they get very dry they recover well once they get another drink. I use warmed tap water or rain water, as if it's too cold it takes a long time for them to use it, sometimes creating good conditions for rot to set in. I give a good watering, wait for a few minutes, then water again. They should never sit in a saucer of water. Don't use water that has been run through a water softener - the chemicals used for this process are salts, which plants dislike intensely. I've gone completely off chemical fertilizers, so to feed them I sprinkle on a small amount of worm castings. This seems to give them all they need for nutrients, without any problems such as burning the roots which can happen with chemical fertilizers. Compost tea is a perfect solution for fertilizing succulent plants - use diluted with rain water if you can, so as not to mark the leaves with calcium or other chemicals from tap water. If you feed with water soluble fertilizers, use half the recommended amount in your regular watering regime. 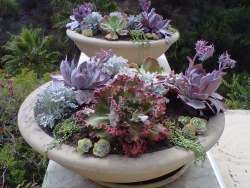 Succulents as a group require very little nutrition, and the over use of fertilizer can lead to weak sappy growth. If in doubt as to if you should water, don't! Leave it another day or so. I water maybe once a week in summer, even when it's very hot, and much less in winter while the plants have a well deserved dormant rest, and I don't fertilize at all until I see new growth in the spring. Use a rock or mulch to protect the soil from the impact of the water; as an added benefit, these will leach out a tiny amount of nutrients, and also retain moisture underneath them. Shading the soil is a good way to make sure that the roots of these plants are not too hot. Although the plants themselves are able to withstand a lot of heat, the roots are more delicate and can be damaged by reflected heat from a wall for instance, especially in a metal container. Use the tips on this page to get your succulents off to a great start, and keep them that way - healthy, happy succulents are the most satisfying of plants and one of the easiest groups to grow by following the guidelines here.